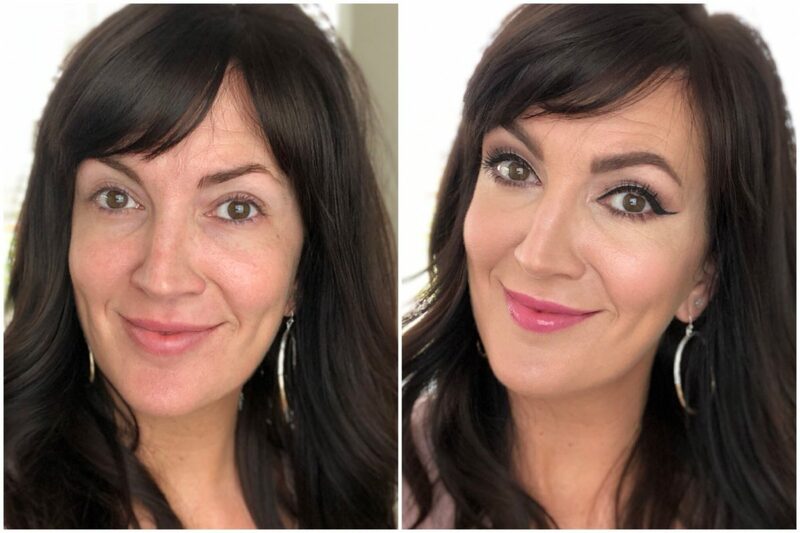 My BEFORE + AFTER using ONLY It Cosmetics products! 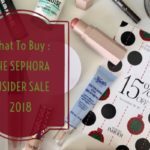 This It Cosmetics friends & family sale is a BIG DEAL ladies. If you’ve been a follower of my blog for any length of time now, you know I’m kinda obsessed with the brand. Yes, in all transparency I get a lot of their products sent to me for free to try when they initially come out. That is a lovely perk of my job as a makeup artist and beauty blogger with this platform, and I’m honestly grateful for them thinking of me. But also as most of you know, I get a lot of products sent to me that never see the light of day on this blog, even from It Cosmetics. 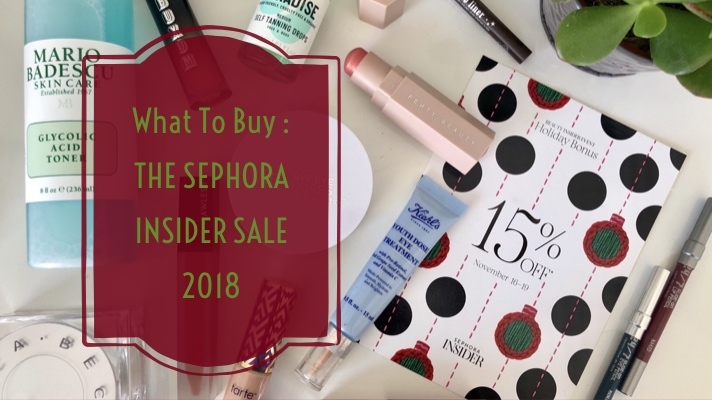 BUT in the same breath, I am here to share the most AWESOME of AWESOME of their products that I think are worthy of sharing with you all if you’ve been considering ever trying the brand. And if you want to try the brand, try it NOW while you get a big discount. MOISTURIZER : Confidence in a Cream, $48. This a staple in my makeup artistry kit. It’s super hydrating & plumping (it says its okay for oily gals, I’ll have to disagree on that point, I use it on normal to dry skin only) with super anti-aging ingredients like collagen and hyaluronic acid. 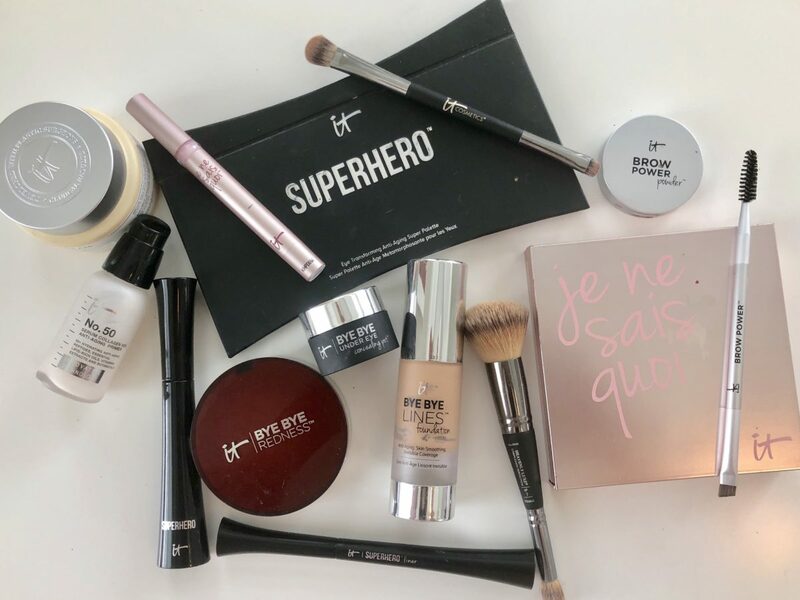 BROWS : Brow Power Powder, $24 + Transformer tool, $24. This powder is a universal brown color, and seriously works for 90% of the faces I work on. 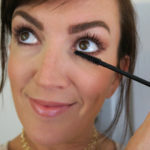 A powder tends to be the easiest tool for most women to use when filling in their brows as opposed to a pencil. This angled brush is the perfect addition for applying the powder and has a spoolie on the end that I usually spray with hairspray at the end and rake through my brows to keep the powder in place. EYESHADOW : Superhero Eye Transforming Anti-Aging Super Palette, $42. This palette consists of 12 different shades with 5 matte shadows and 7 shimmer shadows. Non too too shimmery though so they work for every age group! I used 7 out of the 12 shadows in this palette to create my look. They range from neutral ivory and nudes all the way to super pigmented coppery bronzes and dark navy. EYELINER : Superhero liquid liner, $24. Y’all know I dig a good winged eye and this liner is literally my favorite and stays PUT. MASCARA : Superhero Mascara, $24. If you want to know my feelings on this mascara, check out my YouTube video here. It’s gooood. FOUNDATION : Bye Bye Lines Foundation in shade “medium” (I’m usually “light” in the winter months), $38. This foundation would be perfect if it had SPF, but it doesn’t. Boo. But other than that, I love the airbrush-like finish it gives me and does not highlight my fine lines and wrinkles which always bother me. FOUNDATION + CONCEALER BRUSH : Heavenly Luxe No. 7 Complexion Perfection brush, $48. Literally one of my all time favorite brushes because it’s got your foundation side for liquid creams and a smaller head for concealer application. Both are perfect for dispersing your creams and giving that airbrushed finish. I love not having to use two different brushes for my skin. CONCEALER : Bye Bye Under Eye Concealing Pot, color light, $28. To quote their description, it’s an “anti-aging hydrolyzed collagen, peptides, hyaluronic acid, antioxidants, caffeine and green coffee extract, it’s truly your skin-loving essential for super smooth, super creamy and super weightless FULL-coverage that lasts!” Couldn’t have said it better myself. CHEEKS/BRONZER/HIGHLIGHTER/SETTING POWDER : Je Ne Sais Quoi Complexion Perfection Palette, $42. I did a pretty in depth YouTube video here on how I use this AWESOME palette. Seriously, if I had to suggest you get ONE thing from this list to try, it would be this one. The pink is perfect for every skin tone except for the super dark complexions (just not deep enough). 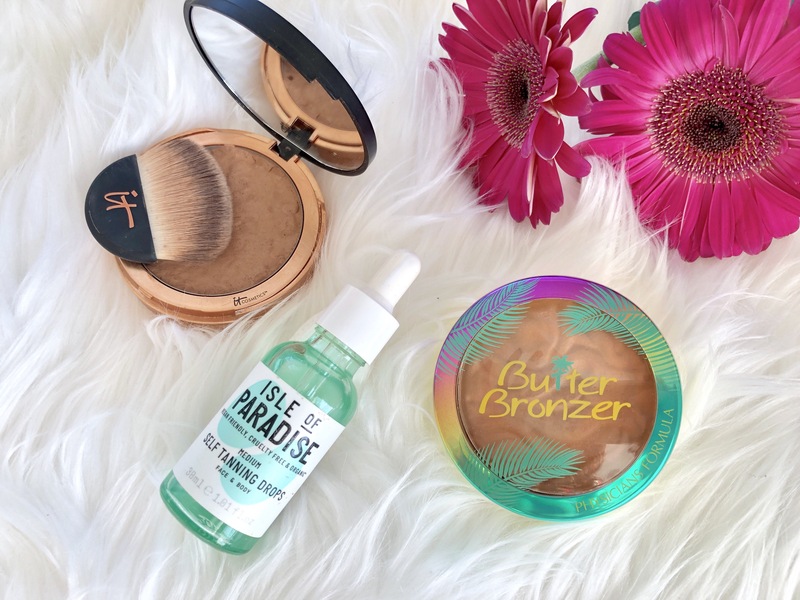 The bronzer has no orange in it and gives a realistic bronze-beachy look, the highlighter is perfectly shimmery without being glittery and the setting powder fades the look of pores. LIPS : Je Ne Sais Quoi Your Perfect Pink Lip Serum, $24. This lip serum literally goes on clear then transforms to your perfect pink lip shade. It has a gloss finish, but not TOO glossy. 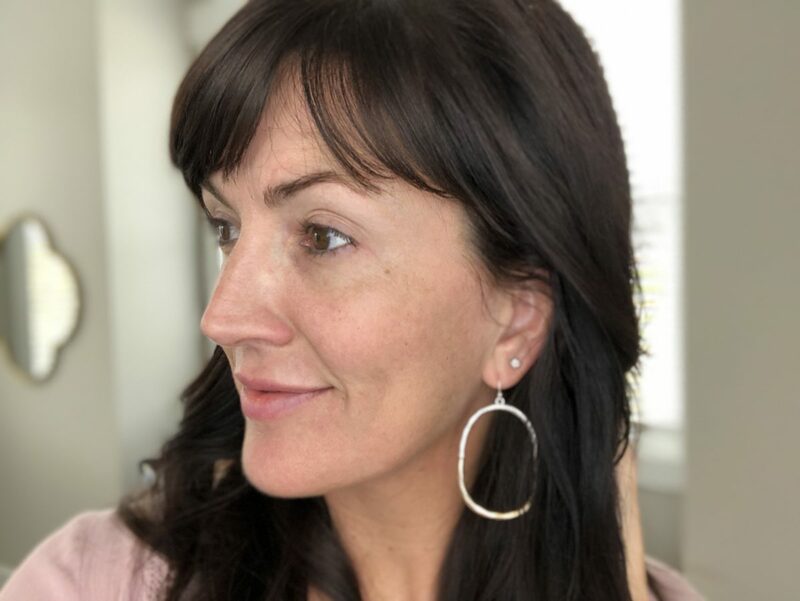 It really pops pink on me, but I tried it on my own mom who has darker skin and it turned a deeper pink that was perfect for her! I love the feel of this serum because it’s not sticky at all!! 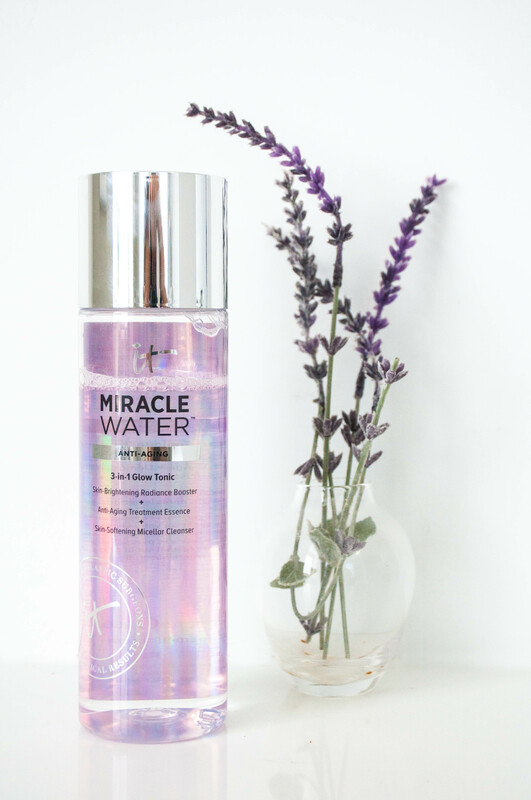 Honorable mention goes to the Miracle Water that I blogged on here. 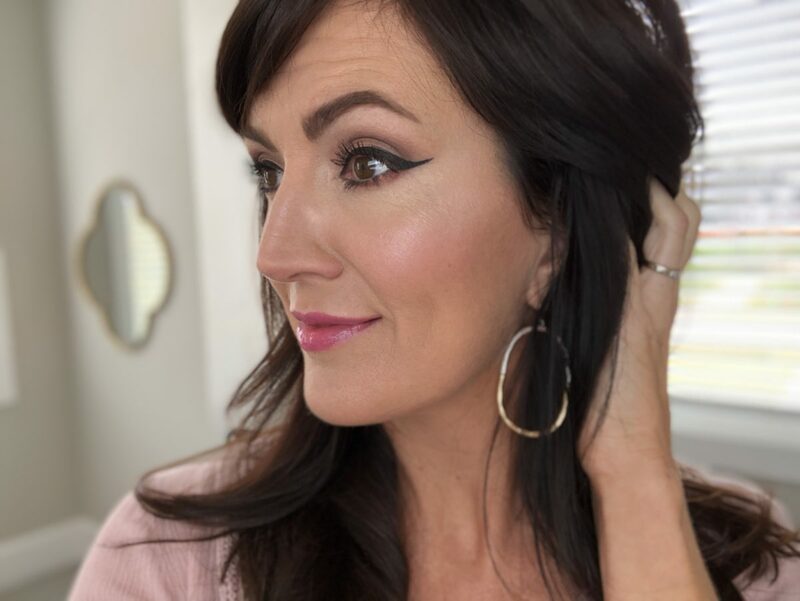 I didn’t use it during this look, but I use it pretty much every morning to remove any access makeup and to give my skin a great finish and clean feel! I honestly haven’t tried any of their products I would say to steer away from. They’re all good. This list is just the cream of the crop in my opinion. And no, It Cosmetics did not PAY me or SPONSOR this post for me to say this 🙂 I’ve tried their foundation powders which are okay, but I’m not a huge powder foundation gal so that’s why I didn’t mention them. I like a dewier look. 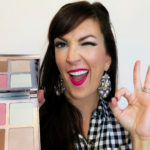 If you’re an It Cosmetics fan, what are you top favorite products? Did I miss any? Share in the comments below so people know what to take advantage of!